The ULTRAMIC® ceramic heaters from Watlow® are designed for thermal applications where the high performance of an advanced ceramic heater is required to ensure optimal effectiveness of the equipment and process. 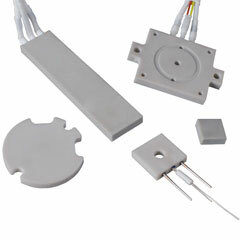 ULTRAMIC ceramic heaters are constructed of aluminum nitride (AlN) and incorporate a thermally matched proprietary heating element that provides maximum performance in challenging applications. AlN is especially suitable for applications requiring a clean, non-contaminating heat source. Additionally, the excellent geometric stability ensures consistent part-to-part thermal contact during heating cycles. Watlow AlN ceramic heaters can operate up to 400°C (752°F) with an ultra-fast ramp rate of up to 150°C (270°F) per second depending on the application, heater design and process parameters. In addition to excellent thermal characteristics, ULTRAMIC ceramic heaters have high electrical isolation and typically provides superior chemical resistance as compared to traditional metal heaters.